Greek Revival single family home. This property, now part of the St. Augustine’s Church “Center for Education & Ministry” building, previously contained two separate house lots with residences on both parcels. Lot number one #31 - #33 Essex St. housed a large duplex structure and lot two #35 had a single family home that had been converted into professional offices. The house at #35, now parking for the Education building #31, was sold by Jacob Chickering in Oct. 1864 to James H. Smith. Smith, Dodge and Beard were business partners who ran a grocery and provisions store at the lower end of Essex St on Red Spring Rd. 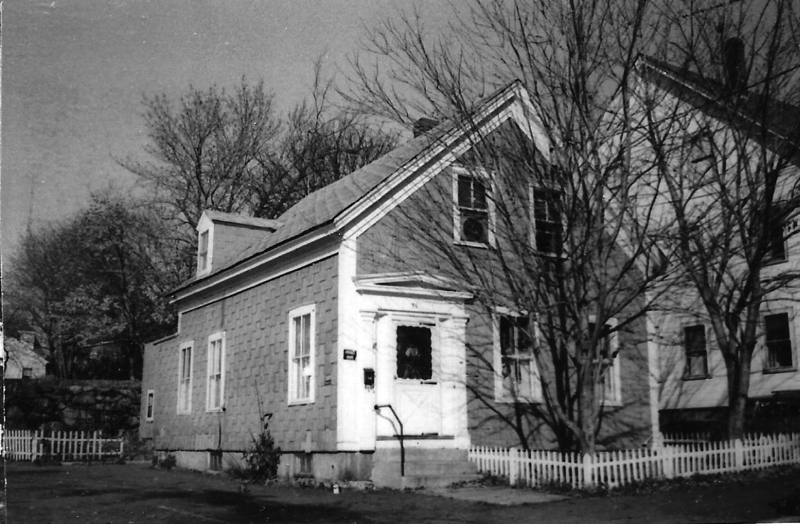 then moved up to 10 Essex Street in 1866 opening Beard and Co. Horace later purchased a home 18 Elm St..
April 27, 1866 Andover Advertiser – Horace P. Beard has purchased of James H. Smith, the house and land on Essex Street, recently occupied by James D. Dodge. Price paid $2000. March 22, 1867 AA – Horace P. Beard has sold his house and land on Essex Street to John Chandler for $2300 on March 3, 1867. John Chandler ran a coal & wood company on Main Street in the Old Barnard Building next to the National Bank. Chandler bought the Paschal Abbott farm at 51 Red Spring Rd. selling this property to John & Harriet E. Harnden on Feb.8 1869. John Harnden & Stillman J. Harnden receive the deed from Chandler on Apt. 17, 1876. Harriet Harnden was a widow when she sold to Annie McCrossan in 1902. McCrossen sold to Charles E. Abbott in 1906 and later was inherited by Frances W. Abbott by probate will. Charles E. Abbott also purchased the Gunnison House next door at #37 Essex St. in 1911 from the Abiah Gunnison estate. Abbott sold both properties to the Clifford E. & Ruth Marshall in 1941. 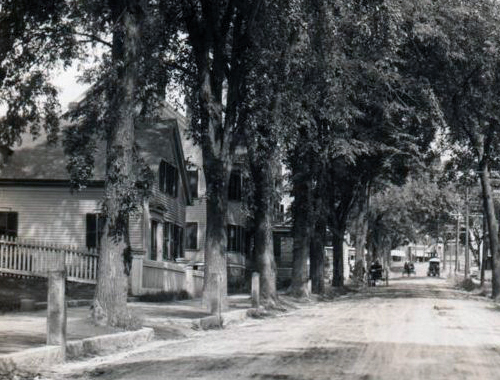 The Gunnison property was sold to the Catholic Archbishop of Boston in Aug. 1956. Robert & Margaret Townsend purchased this house in Oct. 1957. Margaret inherits with the death of Robert on Dec. 11, 1973. She held the property for five more years selling to Thomas & Shelia Zappala in Nov. 1978. The house was used a residence and rental apartment when the rear ell was converted into an apartment. The Zappala family turned the main house into office space for their real estate company Essex Street Realty. The St. Augustine's Parish need for meeting, classroom and office space in closer proximity to the main church building prompted the parish to acquire the adjoining two properties in 2001 for the new Ministry Building. The duplex house at 31 - 33 was probably built by James H. & Elizabeth Connolly. It was sold to Ann Hession, wife of Patrick Hession in May 1912 after the death of Elizabeth Connolly. At some point the house was divided and half #33 was deeded to Catherine Lonergan. #31 remained with Anna Hession. When both owners had died and the estates were settled the entire building was sold to James H. & Annette D. Williams in Aug. 8, 1960. Ann Tarmey acquired the duplex in Aug. 16, 1983 and in Sept. 1989 both Ann Tarmey & Kris L. Williams owned jointly. St. Mary’s Church Society of Lawrence, MA purchased the property in Feb. 2000 and was then deeded to the Roman Catholic Archbishop of Boston on May 10, 2006. The house at #35 was acquired by the church in Feb. 2001. Both houses were razed for the construction of the building and extended paring lot in 2004. The new “Center for Education & Ministry” classroom building was designed by former Andover architect George Namour and is a contemporary nod to the main church sanctuary next door. The three Gothic pointed windows mimic the windows of the church dividing the brick faced front facade, a symbolic reference to the Trinity. The east side and rear of the building is faced in tan stucco with banding to break up the large mass of blank walls. The west side and main entrance has a tower resembling a steeple with glass windows and doors to bring natural light into the educational spaces and function rooms. Harriet E. Harnden widow - Feb. 8, 1869 - b. lf.